On Monday, a plan came together at lunch. We’ve been debating going ahead and trading our almost 12-year-old truck in and getting a newer model. It was a difficult decision, as we’ve put so much money in the older truck to make it reliable. A lot of it is money we wouldn’t get back out of it in a sale, let alone a trade-in. Also, as the truck continues to depreciate in value, expensive repairs, whether preventive or not, are seeming more like money out the window. 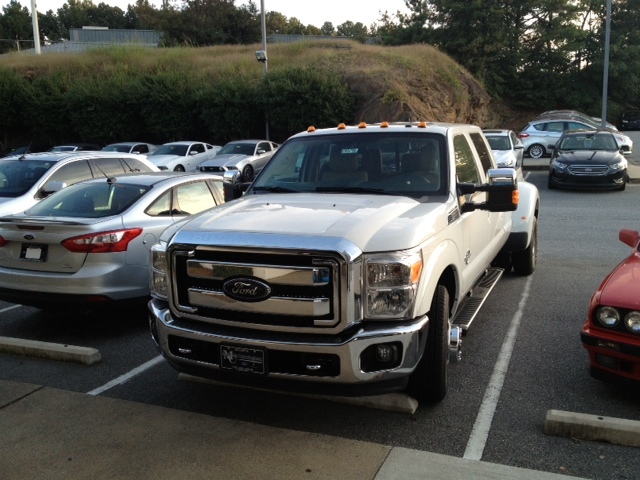 It may not have been the smartest move financially, but we went ahead and drove our truck to Malcolm Cunningham Ford in Atlanta, Georgia to purchase a 2013 Ford F-350 that they had listed on Auto Trader for $48,000. The sticker price was nearly $61,000, so we got a fairly good deal on the new truck. The new truck, waiting for detailing. They only offered us $5,000 on trade-in on our truck. A clean trade, according to NADA, would have been between $9,500 and $10,300, so we decided to keep the old truck and sell it ourselves (clean retail is close to $14,000). 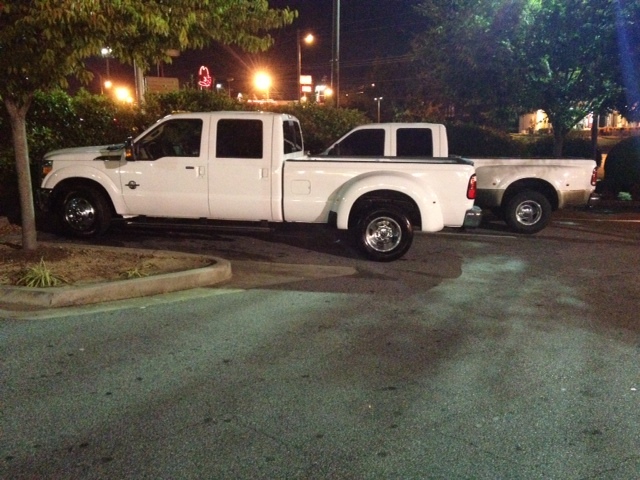 So, we each drove a truck back home. Stopped for a late dinner. By the time we got out of the dealer, it was after 9:00 eastern time and we hadn’t eaten since lunch. So, we made a quick stop at a nearby McDonalds then hit the road for the 2.5 hour drive back home. We arrived back at the campground around midnight and then had trouble getting to sleep for a bit. Then, Malcolm woke back up at 3:45 am and couldn’t get back to sleep, so he has had a tiring day today. Malcolm had a dentist appointment today to do a couple of fillings. After that, he stopped by a place that installs hitches and other truck stuff and got parts ordered to put hitch rails and a bed liner in the new truck. After that, he headed to the trailer for lunch and found Val and David returning for an exercise excursion in the park (David is trying to build up for basic training in February). We ended up driving over to the new Zaxby’s nearby and eating lunch there. Val drove the other truck up to the house (at lunch-time, we had all four of our vehicles at the campground) and took care of some things at the house. After work, Malcolm stopped by the house and we cleaned some items out of the old truck to put in the new truck. Malcolm also removed the tire pressure monitor system sensors and base unit from the old truck. He will install all that on the new truck soon (even though the new truck has a factory tire pressure monitoring system). Dinner was a quick and easy dinner (ramen noodles and apples) since neither one of us was terribly hungry. We popped out to Bed, Bath and Beyond to look at some plastic organizer bins to help organize the bottom of the huge center console in the truck. After that, we stopped by Starbucks to get a coffee, then headed back to the trailer to relax and unwind. Congratulations on the NEW Truck! It looks to be a beauty. I understand that the new Ford trucks are like riding in a luxury car and are a pleasure to drive with all the power needed to tow a 5th wheel.